There’s a distinctive quality about the Cadillac Escalade that’s certainly impressive and makes it easy for you to see what you want when it’s time to have a great drive. This massive and luxurious SUV has been one that’s admired for its look, its size, and the Cadillac name it wears. Take a look at the full-Led headlights with four crystals that act as the high beams. Check out the smattering of Chrome that’s situated exactly where you want it to be and let this be the big SUV that will let you have the quality drive you want to enjoy. Get inside the cabin if the Cadillac Escalade and you’ll see this is a vehicle you can stretch out in and admire the expanse of leather and wood that makes it a large SUV that can be ideal for you to have the comfort and style you’ve been after. Up front, you’ll see a ton of electronics that connect you the way you want and in the rear is a massive cargo area that can fit all the stuff you need to take with you when you head out for a weekend adventure with the family. 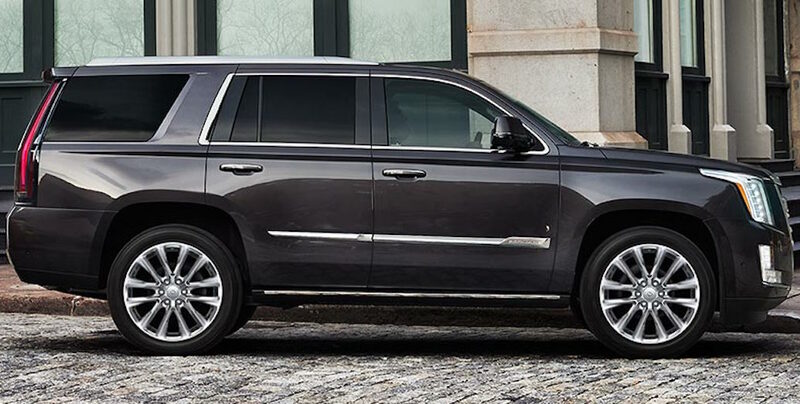 The Cadillac Escalade starts with a package of items you’re sure to admire including 12-way power adjustable seats, 20-inch chrome plated aluminum wheels, Magnetic Ride Control, a hands-free power liftgate, a remote engine starter, tri-zone climate controls, heated and cooled front seats, a surround vision camera, Apple CarPlay, Android Auto, onboard Wi-Fi connectivity, a navigation system, a sixteen-speaker Bose audio system, the CUE infotainment system with a navigation system included, and much more for the drive you’re sure to love inside the amazing Cadillac Escalade. There’s only one powertrain offered for the Cadillac Escalade and it starts with the powerful 6.2-liter V8 engine to give you 420 horsepower and 460lb.-ft. of torque. This engine is attached to the new ten-speed automatic transmission to offer you a smooth drive on the roads you travel. You can have either 2WD or 4WD for the ride and should use premium gasoline in this luxury vehicle. This big brute is powerful enough to offer you the drive you need when you want to take a boat to the lake or need to take a trailer with you for the event you’ve got planned. You can’t deny what the Cadillac Escalade is as it’s never changed because it’s been the leader in the luxury SUV market for a long time. Take this amazing and luxurious SUV out on the road with you to be the right one for you to have the capability you need and the power you’re looking for. Take a look at the list of excellent features offered when you visit your nearby Cadillac dealership and you’ll be glad you chose this big and classy ride as the one that will let you have the great drive you want to have wherever you need to go.